I think the delayed arrival of spring has affected a lot of us in many ways :) Not too much going on anywhere! That being said, grab a cup of your preferred beverage, and slip into something comfortable for some good reading and viewing. I love this emagazine and it's free. Artizen. Simply sign up for the emailed version and peruse at your own convenience. Each issue is themed monthly and covers a wide variety of professional artists in many media. There is Art Trader too (also free), which may be closing soon, but back issues are still online. 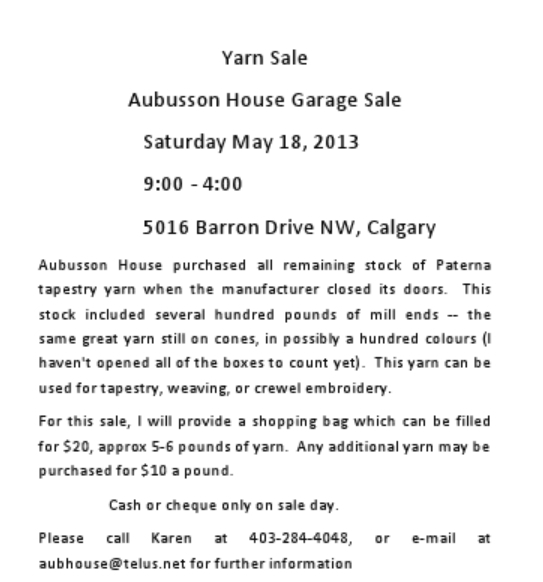 Karen King of Aubusson House is having a giant yarn sale!! Think outside the box if you're not a "needle worker". Yarns can be building blocks for so many techniques and projects. A wonderful art-materials-for -free location. One can go over to The Calgary Herald building, 215 - 16th Street S.E. , Calgary, Alberta T2E 7P5 and park in the bay (not blocking the gate of course) close to the signage for "Shipping and Receiving", and follow the clear signage to Roll Ends. My advice is to take with you a donation (they don't give change, I gave $5,) and the nice lady will accept your money and take you to a stack of end of rolls.She suggested I pick up 4 rolls for my donation (I only needed 2). Easy and painless... One need never buy this sort of paper again from art material shops. Again, we plead for content! If you have work to share, news about exhibits--yours or other artists, publications or interesting sites. 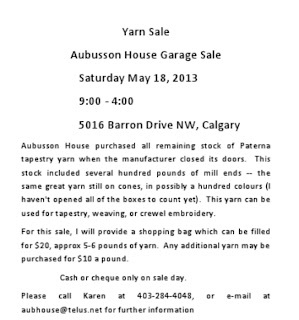 Please share with us and for the blog.